Im Vorfeld des G-8 Treffens haben Russland und China erneut den US-Dollar als Leitwährung in Frage gestellt; Reuters berichtet (’Russia, China to push global currency at G8 summit‘). Seit Monaten propagiert China die SDRs als Alternative; im März schrieben wir dazu (’China bläst zum Sturm auf die Dollar-Bastion). Brasiliens Lula sitzt mit im Boot und Indien zeigt sich einer Diskussion nicht abgeneigt und erwägt eine Diversifizierung. Am 30.6. hat der IWF die vierteljährlichen Daten zur globalen Währungsreserve mit Devisenaufschlüsselung publiziert – Currency Composition of Official Foreign Exchange Reserves (COFER). Von den gesamten 6,531 Trillionen US-Dollar sind lediglich 62,1% einzelnen Währungen zugeordnet. Länderspezifische Daten waren nicht zu erhalten. Die Aufschlüsselung der einzelnen Währungen ergab im ersten Quartal 2009 für den USD einen Anteil von 65,0%, EUR (25,9%), GBP (4,0%), JPY (2,9%), CHF (0,1%) und andere (2,1%). Insgesamt sanken die globalen Reserven um 2,6% zum Vorquartal und 5,2% zum Vorjahresquartal. Die Quartalszahlen werden erst seit 1999 veröffentlicht, seither wurde nun der erste Rückgang auf Jahresbasis notiert. There is clearly a great deal of uncertainty on portfolio composition of China’s FX reserve holdings. We assume that China’s FX reserves have similar percentage shares of portfolio holdings in December as they did in November where we use the percentage shares of Chinese holdings of US assets from a paper published by Council on Foreign Relations after authors adjust for their estimated undercounting. These portfolio shares assume about 72% of China’s foreign assets are invested in US assets, out of which, 85% are invested in US Treasuries (37% of total Chinese foreign assets) and US agencies (25% of Chinese foreign assets), and a much smaller share is in corporate bonds and equities. We apply these shares to China’s official FX reserves and assume the remaining 28% of FX reserves are in EUR- and JPY denominated bonds with a ratio of 2:1. Also USD 72%, EUR 18,6% und JPY 9,3%. ‘Der Economist’ aktualisierte seinen Big Mac Index per Ende Jan./Anfang Feb.; einen Beitrag zum Index brachten wir im August letzten Jahres. Bedingt durch die USD-Stärke bzw. Schwäche diverser Währungen in den letzten Monaten bauten sich einige Über-/Unterbewertungen ab. Der Euro war Ende Juli 2008 noch mit 50% überbewertet, jetzt liegt die Überbewertung bei +24%. Die noch im letzten Jahr beschriebenen Unterbewertungen einiger asiatischer Währungen, blieben grossteils bestehen, die Yen-Stärke führte im ‘Hamburgern Standard’ nahezu zu einer Parität Yen-USD (-9%). Weiterhin stark überbewertet zum US-Dollar zeigt sich der Schweizer Franken (+ 58%) wie auch die norwegische Krone (+ 63%). Jim Rogers bläst zum Ausstieg aus dem Vereinigten Königreich. Nun, wer es nicht ohnehin schon getan hat, bekommt jetzt einen neuen Anlass. Das britische Pfund sieht er zum US-Dollar auf einen neues Rekordtief fallen; das Letzte notiert bei 1,0520 aus dem Februar 1985.
wie man hier leicht erkennen kann. Wann werden diese Armleuchter endlich kapieren, daß die Weltwirtschaft und die Märkte sich nur mit einem schwachen Dollar erholen werden ?? The RBA announced today that it had intervened for the second consecutive month in the spot currency markets. Though the risk of co-ordinated G7 intervention remains modest, the risks of unilateral intervention amongst the majors now are rising as Australia’s action shows. The BOJ seems the most likely central bank to follow the RBA especially as the G7 last month issued a statement at Tokyo’s behest warning about excessive volatility in the JPY. 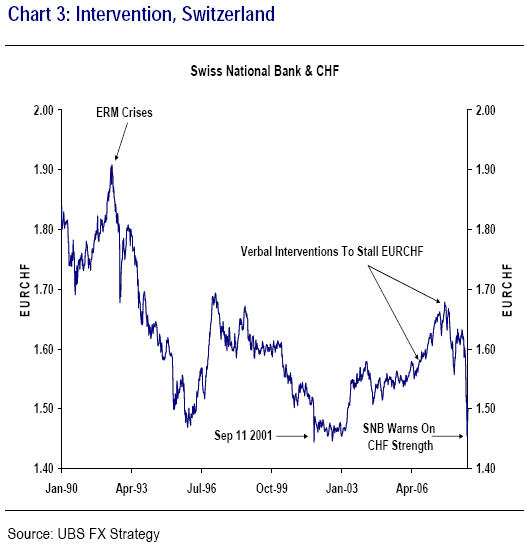 The SNB also continues to warn on the CHF as its currency makes hew highs against the EUR. But its intervention track record has been very limited over the last couple of decades. In contrast Washington and Frankfurt seem unconcerned by the sharp moves in the USD and EUR since the summer while the BOE continues to talk down the GBP despite the currency already having plunged across the board. The Reserve Bank of Australia announced today that it had intervened again in the spot currency markets. 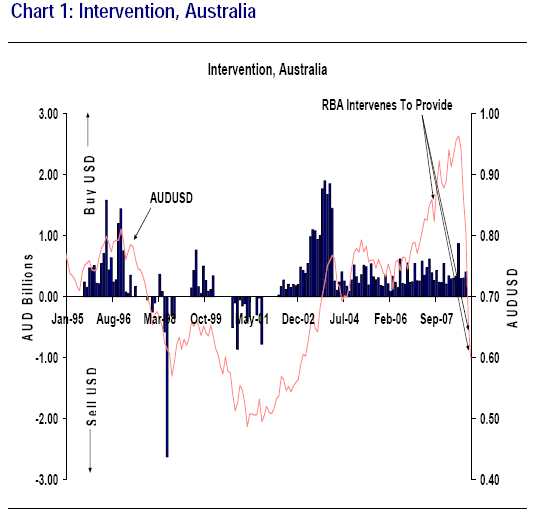 Though the RBA has been passively intervening to build up foreign exchange reserves over the last few years of AUD strength as Chart 1 shows, it has intervened now in the opposite direction on three occasions “to restore liquidity” when the AUD has plunged since the global credit crisis began last year. These episodes are August 2007, October 2008 and again today. As Chart 1 shows the RBA is not trying to draw a line in the sand under the AUD. But its actions show how the risk of unilateral intervention is rising amongst the majors – even as the G7 remains unlikely to undertake co-ordinated intervention in the currency markets. The Bank of Japan seems the most likely central bank to follow the RBA – especially as the G7 issued a statement at Tokyo’s behest at the end of October warning about excessive volatility in the JPY. 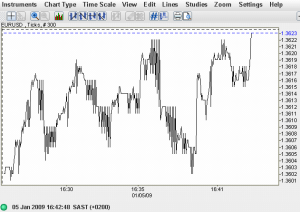 In effect the other G7 member states have given Tokyo the green light to unilaterally intervene in the markets. 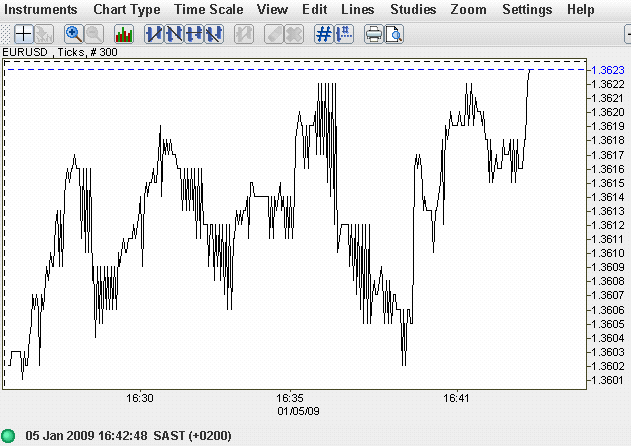 As Chart 2 shows this would be the first time Tokyo has acted since March 2004. The authorities didn’t react when USDJPY fell to 95 after Bear Stearns failed in March. But when USDJPY fell towards 90 at the end of last month, Tokyo prompted the G7 statement, suggesting it is reaching the limits of its tolerance on the JPY. The Swiss National Bank also continues to warn on the strength of the CHF. As Chart 3 shows EURCHF fell to a new low at the end of last month below the 1.44 level reached in the aftermath of the September 11 2001 attacks. But the SNB has only intervened on two days in the past couple of decades in the spot currency markets and that was in the old DEMCHF exchange rate. This month’s intermeeting 50bps rate cut by the SNB suggests the Swiss authorities still want to use interest rate changes to stop excessive moves in the CHF for now. The other major central banks seem much less likely to unilaterally intervene in the currency markets. 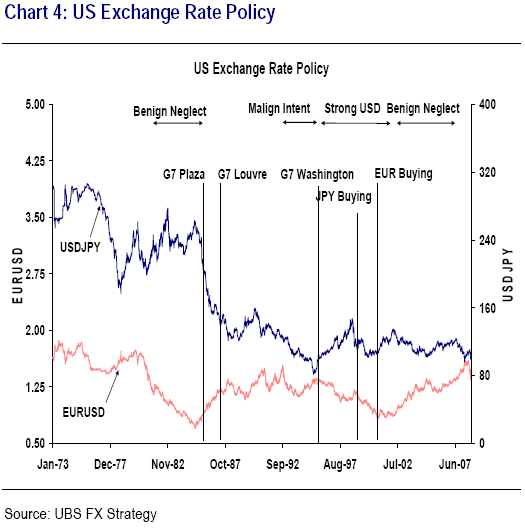 Chart 4 shows the stance of exchange rate policy for the United States. Changes in Washington’s view on the USD tend to result in co-ordinated intervention with America’s other G7 partners. The period of ‘benign neglect’ of the soaring greenback in the early 1980s ended with the G7 Plaza Accord to weaken the USD in 1985. 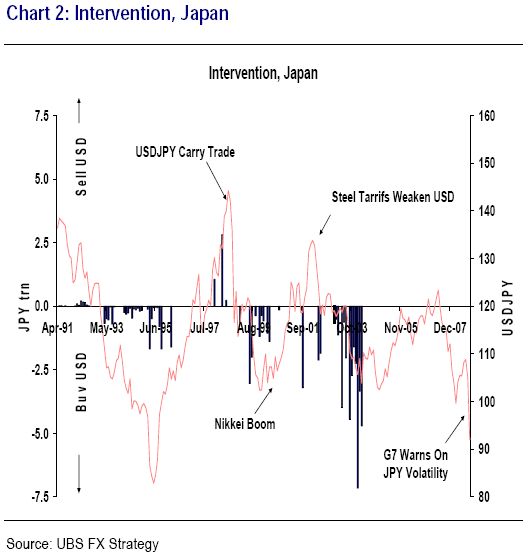 The ‘malign intent’ shown by President Clinton’s first Treasury Secretary Lloyd Bentsen towards the value of the USD against the JPY (in order to force Japan to open its markets more to US imports) ended with the 1995 Washington agreement to support the USD. 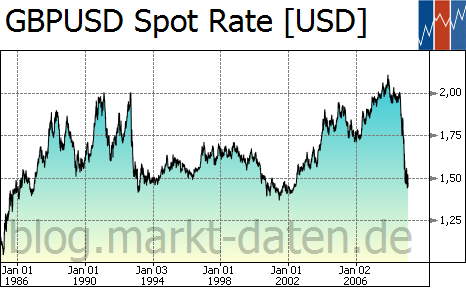 And the effective pursuit of a ‘strong USD’ policy ended in September 2000 when the US along with the BOJ, BOE and BoC agreed to help the ECB defend the EUR against the USD. During the Bush administration, Washington has followed a policy of benign neglect to the falling USD during this decade. This ended this summer when the record weakness of the greenback against the EUR at 1.60 forced both the Federal Reserve and the US Treasury to warn the markets sharply on the external value of the USD. Conversely, with the greenback now having rebounded back towards its long term fair value of 1.20 against the EUR, US policymakers have stopped commenting on the currency. Similarly, the ECB seems little focused on the EUR now that it has fallen back from its record levels against the USD since the summer. Of course foreign exchange volatility has been extreme as Chart 5 shows. 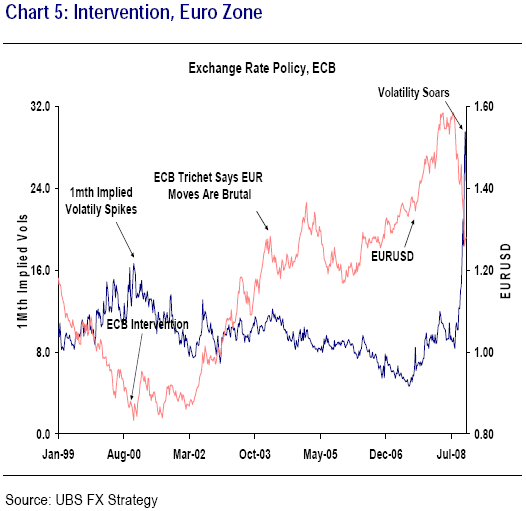 Indeed one month implied volatility in EURUSD has soared far above the levels reached in September 2000 when the ECB persuaded the Fed and other central banks to intervene together to support the EUR and restore order to chaotic trading. But at that time volatility was increasing as the single currency was becoming more undervalued and therefore misaligned. In contrast this year, volatility has soared again but the EUR has fallen back towards its fair value levels against the USD rather than becoming more overvalued (and misaligned). Amongst the major economies, Britain’s central bank seems to be the only authority that is actively welcoming the weakening of its currency. This year Monetary Policy Committee members including Bank of England governor Mervyn King have repeatedly stressed the benefits of a falling pound for the broader UK economy. 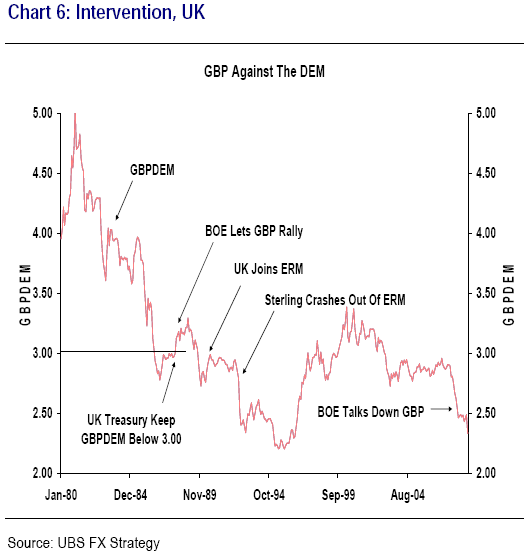 At the same time the rapid interest rate cuts by the BOE have helped push sterling down towards record lows against Europe’s currencies as Chart 6 of the GBP against the old DEM shows. This month governor King warned the authorities did not want to see “a particularly sharp drop in the GBP” even as he noted that the current fall in the currency was inevitable to rebalance the economy. But for now the GBP remains above its lows recorded after it was ejected from the old European Exchange Rate Mechanism (ERM) in 1992. As a result the authorities in London are unlikely to consider following the RBA’s actions in the spot currency markets soon. Bottom line: the RBA intervention today to support the AUD has increased the risk that other central banks also unilaterally intervene in the currency markets. The BOJ seems most likely to follow suit if USDJPY falls quickly towards 90. In contrast the SNB seems likely still to fight exchange rate strength through interest rate changes. Amongst the other major economies, the US, UK and Euro remain much less willing to consider unilateral intervention. This will keep the chances of co-ordinated G7 intervention modest too. Oct. 31 (Bloomberg) — The Bank of Japan cut its benchmark interest rate to 0.3 percent in a split decision to help stave off a prolonged recession. Governor Masaaki Shirakawa cast the deciding vote to lower the key overnight lending rate from 0.5 percent after four of the eight board members dissented, the central bank said in Tokyo today. Three wanted to cut the rate to 0.25 percent, and one voted to leave it unchanged, Shirakawa said. “A rate cut will probably do little to prop up the economy; nevertheless the bank was probably fearful they’d be viewed as clinging to an overly rigid stance in the middle of a global crisis” if they didn’t move, said Teizo Taya, a former Bank of Japan board member who now advises the Daiwa Institute of Research. The yen rose to 96.87 per dollar at 5:54 p.m. in Tokyo, from 98.43 before the decision. Japan’s currency climbed as high as 90.93 a week ago, the strongest in 13 years, threatening exporters’ earnings. The Nikkei plunged 5 percent today, capping a record 24 percent monthly decline. The central bank slashed its growth forecast for the year ending March to 0.1 percent from 1.2 percent predicted in July. The economy will expand 0.6 percent next fiscal year and 1.7 percent in the period starting April 2010, it said in a twice- yearly outlook published after the rate decision. Interventionen der BOJ/MOF zur Schwächung des Yen? Dieser Tage liest man viel von möglichen Interventionen der Bank of Japan bzw. des Japan Ministry of Finance um die Aufwertung des Yen zu stoppen. Mit Blick auf die jüngere Vergangenheit, darf die Wirksamkeit derartiger Operationen jedoch bezweifelt werden. Zum einen zeigte sich im Frühjahr 2004, während der letzten bekannten Intervention, daß eine Aufwertung des Yen bestenfalls kurzfristig gestoppt werden konnte. Mittel- und langfristig, für jeden Horizont der über das Tagesgeschäft hinausreichte, ergab sich kein spürbares Nachlassen des Aufwertungsdrucks. Und das, obwohl die BoJ zeitweise mehr als 10 Milliarden USD pro Tag gekauft hat. Zieht man nun die seither gestiegenen Umsätze und die heute (im Prinzip) höhere Liquidität der Devisenmärkte in Betracht, so bleibt anzunehmen daß wirksame Interventionen hohe zweistellige Milliarden Dollarbeträge erfordern würden. Der einzige Angriffspunkt wäre hier die derzeitige generelle Liquiditätskrise, die alle Bereiche der Finanzmärkte erfasst. Hierin besteht wohl die größte denkbare Chance für ein solches Unternehmen. 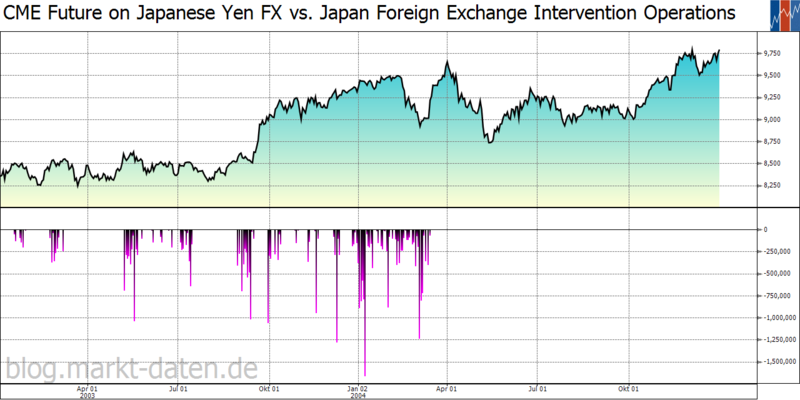 Die folgende Grafik zeigt die Yen-Verkäufe (in Mio JPY) – und den Chicagoer Future auf den Yen in der inversen JPYUSD-Notierung. Seit 1986 publiziert ‘The Economist‘ den Big Mac Index. Gerüchten nach während eines Lunchs konzipiert, ist der Index nun bereits in seiner dritten Dekade. 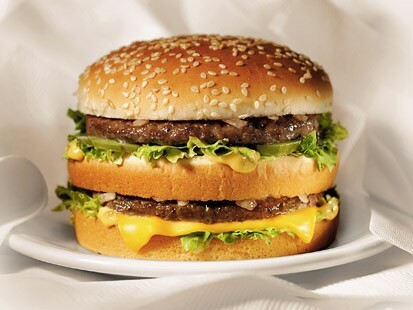 McDonald´s Big Mac verkauft sich weltweit und bietet sich so als ‘Warenkorb’ an. Aus 120 Ländern werden die lokalen Preise in Relation zum USD-Preis in den USA gesetzt; heraus kommt der ‘Hamburger Standard’. Abhängig von der Kaufkraft der Währung eines Landes ergeben sich unterschiedliche Preise; ermittelt wird anschliessend die Unter- bzw. Überbewertung zum USD. Die lokalen Preise werden zudem vom jeweiligen Lohnniveau, den lokalen Materialpreisen, Steuern etc. bestimmt; eine Vergleichbarkeit ist somit nur bedingt gegeben. Der ‘Economist’ hat auch gleich von Beginn den Fast-Food-Index mit dem entsprechenden Augenzwinkern versehen. The index was never intended to be a precise predictor of currency movements, simply a take-away guide to whether currencies are at their “correct” long-run level. Curiously, however, burgernomics has an impressive record in predicting exchange rates: currencies that show up as overvalued often tend to weaken in later years. But you must always remember the Big Mac’s limitations. Burgers cannot sensibly be traded across borders and prices are distorted by differences in taxes and the cost of non-tradable inputs, such as rents. Es wurde für Deutschland und Japan die Bewertungen zum USD und das jeweilige Währungspaar im zeitlichen Ablauf dargestellt. 11.04.2008 Faz.net Der Makroökonom Harald Uhlig kritisiert im Interview mit der FAZ die Risiken einer Politik, die zwar den Banken hilft, aber neue Probleme schafft. Wie es aussieht, gleiten die Vereinigten Staaten im ersten Halbjahr in eine Rezession. Fürchten Sie, dass es ein schwerer Einbruch sein wird? Bislang sieht es nicht danach aus. Ich glaube hier Ben Bernanke, dem Vorsitzenden der amerikanischen Notenbank Fed, dass die Rezession recht milde sein wird und sich die Wirtschaft im zweiten Halbjahr wieder erholt. Er hat sicherlich auch Grund zum Zweckoptimismus. Wenn er stattdessen sagte, dass die Banken alle einstürzen, dann würde er mit solchen Worten die Krise selbst verursachen. Es könnte allerdings sein, dass das Kartenhaus der Wall-Street-Banken doch noch einbricht. Die schlechten Nachrichten kommen ja nur tröpfchenweise heraus. Wer weiß, vielleicht haben die doch noch Leichen im Keller. Dann könnte es doch noch zu einem großen „Run“ auf die Banken kommen, und wir hätten eine schwere Krise. Das ist nicht wahrscheinlich, aber sicher nicht unmöglich. Die Fed hat vor kurzem die Rettung der Investmentbank Bear Stearns durch einen Kredit über 30 Milliarden Dollar ermöglicht. Bernanke schätzt das „systemische Risiko“ höher ein als das Risiko von Fehlanreizen, wenn letztlich der Steuerzahler spekulative Pleitiers rettet . . .
Wahrscheinlich hat Bernanke seine Sache letztlich richtig gemacht. Er kennt die Details der involvierten Banken. Mich hat die Rettungsaktion aber dennoch erschreckt. Es ist nicht die Aufgabe der Fed, eine einzelne Bank, die sich verspekuliert hat, herauszuhauen. Wenn Bear Stearns den Bach runtergeht, dann sei’s drum. Bernanke muss große Angst gehabt haben, dass ein Bankrott von Bear Stearns einen „Run“ auf andere große Banken und eine Katastrophe an der Wall Street ausgelöst haben könnte. Die Fed hat seit September die Leitzinsen von 5,25 Prozent auf 2,25 Prozent gesenkt. Hilft das der Wirtschaft? Es hilft zunächst mal den Banken, die sich erheblich preiswerter refinanzieren können. Hilft es der Wirtschaft? Eher wenig, glaube ich. Meine Forschungen haben gezeigt, dass der Effekt dieser Zinssenkungen auf die Wirtschaft unklar ist. Eine Rezession kann man damit eher nicht verhindern. Welche Folgen hat die starke Lockerung der Geldpolitik dann? Wenn die Fed den Geldhahn aufdreht, wird die Währung abgewertet. Wir sehen schon jetzt, dass der Wechselkurs des Dollar stark nachgegeben hat. Mittelfristig bildet sich ein ziemliches Inflationsproblem. Um die Banken zu retten, belegt die Fed alle, die Dollar in der Tasche haben, mit einer Inflationssteuer. Und die riesigen Geldmengen, die jetzt auf dem Markt sind, müssen wieder abgesaugt werden. Die ausgewiesene Inflationsrate liegt in Amerika deutlich über 4 Prozent. Haben die Währungshüter das aus dem Auge verloren? Es gibt einen großen Unterschied zwischen Amerika und dem Euro-Raum: Die Europäische Zentralbank hat das Mandat, die Preise stabil zu halten, aber die Fed hat das nicht. Bernanke hat zwar bei seiner Ernennung versucht, die Senatoren zu überzeugen, dass die Fed langfristig vor allem die Inflation steuern sollte. Aber beschlossen wurde es nicht. Könnte es in Amerika zu einer Stagflation kommen, also einer stagnierenden Wirtschaft bei zugleich hoher Inflation? Wir werden in den kommenden Monaten erleben, dass die Wirtschaft stagniert oder schrumpft und die Inflation bei 4 bis 5 Prozent liegt. Das könnte man Stagflation nennen. Regierung und Kongress haben ein großes Konjunkturprogramm aufgelegt, um Konsum und Investitionen zu stimulieren. Man nimmt dafür hohe Defizite in Kauf. Wird diese Politik helfen? Ich habe große Zweifel. Solche Konjunkturprogramme sind wie „Strom aus der Steckdose“ – der muss ja irgendwo produziert werden. Das Geld, das die Regierung den Leuten gibt, muss sie ihnen an anderer Stelle später wieder abnehmen. Man verlagert die Lasten in die Zukunft. Hohe Schuldenlasten müssen irgendwann zurückgezahlt werden, und das belastet die Wirtschaft schon jetzt. Möglicherweise haben auch die hohen Ausgaben durch den Irak-Krieg zur gegenwärtigen Misere beigetragen. Wie stark trifft die Rezession in den Vereinigten Staaten den Euro-Raum? Der europäische Konjunkturzyklus ist flacher als der amerikanische. Ich erwarte nicht, dass die amerikanische Rezession stark durchschlagen wird. Hinzu kommt, dass viele Investoren jetzt ihr Augenmerk auf Europa richten, denn Europa erscheint im Vergleich zu Amerika als die gesunde Ökonomie. Die Wirtschaftszahlen in Deutschland sehen wunderbar aus. Teilen Sie also die These, dass sich Europa von Amerika konjunkturell abkoppeln kann? Der Großteil des europäischen Wirtschaftsgeschehens passiert innerhalb Europas. Außerdem exportieren die Europäer auch kräftig nach Asien. Sicher, auch die asiatischen Wirtschaften werden unter der amerikanischen Rezession leiden. Es gibt zwar so etwas wie eine Weltkonjunktur, doch der Effekt für Europa wird milde sein. Der Euro-Wechselkurs beunruhigt viele deutsche Exporteure. Schadet das sehr? Der hohe Wechselkurs hat immer zwei Seiten: Er mag schlecht sein für die Exporteure, aber er ist gut für die Importeure. Die EZB hat das Mandat zur Wahrung der Preisstabilität. Im Moment hilft der hohe Euro-Wechselkurs, weil er den Inflationsdruck vermindert. Die Bank of Canada hat gerade bekannt gegeben, ihren Leitzinssatzsatz um 50 Basispunkte auf 3,50% zu senken. Man sei zwar mit dem kanadischen Wirtschaftswachstum zufrieden, zudem halte sich die Inflation im Rahmen der eigenen Erwartungen. Aber auch hier spuken die Schreckgespenster US-Rezession und Kreditkrise. Ein Übergreifen der US-Finanzkrise wie des konjunkturellen Abschwungs auf die globale Wirtschaft wird befürchtet. Gegensätzlich die heutige Entscheidung der Reserve Bank of Australia, die ihren Leitzinssatz bereits das zweite Mal dieses Jahr um 25 Basispunkte auf nun 7,25% anhob. Ausschlaggebend war eine gestiegene Inflationsrate. Nichtsdestotrotz schaut man auch über den Tellerrand. US-Notenbank senkt den Leitzins um -75 Bsp. Bei extremer Volatilität sind die internationalen Märkte heute weiter in der Abwärtsbewegung. Eine Stunde vor Handelsbeginn der US-Börsen zieht die US-Notenbank die Notbremse und senkt den Leitzins um -75 Bsp. von zuvor 4,25% auf nun 3,50%. Im Chart die Leitzinssätze der Notenbanken aus den USA, England, Japan sowie der europäischen Zentralbank.